Chesterfield’s four-game unbeaten run in League One came to an end against Bradford City. The Spireites played the majority of the second half with ten men after Sam Morsy was shown a straight red card early after the break. Billy Clarke scored the game’s only goal for the Bantams who could have had more if Jon Stead had decided to wear his scoring boots. Chesterfield piled on the pressure in search of an equaliser with Jay O’Shea bringing out the best of Bradford keeper Jordan Pickford. But, despite their best efforts, the Spireites couldn’t find the goal they craved against a Bradford side who move to within a point of the play-offs. With both teams geared up to attack and in good form ahead of kick-off, it was no surprise to see an open and end to end start to the game. The visitors had the better of the opening exchanges with Andrew Davies forcing an early save out of Tommy Lee when he rose at the back post to meet Filipe Morais’ cross. Bradford, with four wins from their last five, should have taken the lead but an unmarked Jon Stead headed over from close range to let Chesterfield off the hook. Stead, the former Sheffield United striker, posed a physical challenge to Charlie Raglan and Georg Margreitter at the heart of Spireites’ defence and saw a lot of the ball early on. He was guilty of throwing himself to the floor rather theatrically in an attempt to win a penalty for his side moments later, but referee Eddie Ilderton waved away his protests. That kind of behaviour won him no admirers from the home section, who made their feelings known. Mr Ilderton then came under fire for a handful of controversial decisions that went against the hosts. Stead clattered in to Margreitter mid-air, Gary Liddle was awarded a soft free-kick when he appeared crowded out and there was more to follow when Morais was late on Sam Clucas. No wrong doing, ruled the man in the middle. Chesterfield were getting most joy down the flanks, Jay O’Shea crossed for Armand Gnanduillet to head over leaning backwards. Margreitter gifted Andy Halliday a sight of goal when his clearance fell to the midfielder’s feet, his cross come shot escaped the attentions of everyone in the six yard box. Roberts and O’Shea combined for Doyle who tried to re-direct the ball beyond Jordan Pickford only for the former Alfreton Town loanee to stand tall and make the save. Jimmy Ryan unleashed a fizzing effort through a crowd of players that the Bradford keeper did well to see, stop and grab at the second attempt ahead of Doyle rushing in. 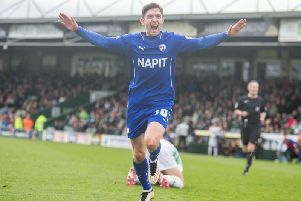 A training ground move fell flat on its face for the Spireites when Doyle completely missed the ball on the edge of the area and Bradford broke with alarming speed. It was three on two with more shirts flooding forward but the move lost all momentum when played out wide when an unmarked Morais was screaming for the ball centrally. Halliday threatened with a thunderous strike of his own that flashed past Lee’s right hand post as the game petered in to half-time. Morsy shown a straight red card for seemingly throwing an arm that caught Halliday in the face. The decision looked harsh on Morsy but he was forced to leave the pitch. Roberts was handed the armband as Chesterfield had to play the large proportion of the second half with ten men. Paul Cook also re-shuffled the pack, going 4-4-1. Doyle dropped in to right midfield, O’Shea moved inside to play alongside Ryan and Gnanduillet was left alone up top. Bradford would make the hosts’ task that much harder. Billy Clarke collected the ball 25 yards from goal, turned and unleashed a superb curling strike that flew past the outstretched arm of Lee and in to the top corner. Chesterfield were on the rocks and when Clarke broke the offside trap and crossed for Stead, the striker looked to have the simple task of rolling the ball in for number two but directed his shot against the post from close range. Lee spread himself and was forced in to a vital stop to deny Morais when the midfielder was sent through on goal to keep his side in it. The Spireites responded and piled on the pressure with Roberts thwarted by a clear handball by a Bradford defender as he looked to wriggle his way through a packed penalty area. O’Shea brought the best out of Pickford with a powerful drive the Bradford keeper did well to tip over his own bar. Roberts tried to find the bottom corner with a curling shot from the edge of the area that Pickford was equal to diving to his right, as Chesterfield chased an equaliser their second half performance warranted. O’Shea and Darikwa saw shots blocked as Bradford attempted to kill the game by winding the clock down. Cook turned to Dan Gardner and Romy Boco who came on for Darikwa and O’Shea with ten minutes of the game remaining but neither were able to provide the spark Chesterfield needed.